Recent studies show approximately 25% of patients with diabetes will develop a foot ulcer within their lifetime; the annual US burden of diabetic foot ulcers is estimated to be at least $15 billion. Routine comprehensive foot examinations and risk assessments are essential to preventing diabetes-related lower extremity complications and formidable foot ulcerations. Recent studies show approximately 25% of patients with diabetes will develop a foot ulcer within their lifetime; the annual US burden of diabetic foot ulcers is estimated to be at least $15 billion.2 There is an estimated 3% yearly diabetes mellitus population risk of ulcer, with a 7% yearly risk in diabetes patients with neuropathy, and an estimated 30% to 58% of patients with diabetes will develop neuropathy. Recent data cite that 25% of diabetes-related hospital admissions are for extremity complications. Diabetic lower extremity ulcerations are multifactorial. General risk factors for lower extremity complications in diabetes include being male, having diabetes for more than10 years, poor glycemic control, microalbuminuria, retinopathy, renal disease, increased pulse pressure, age, and tobacco and alcohol use.3-5 The priority risk factors appear to be having diabetes for more than10 years, being male, and poor glycemic control. The risk factors are cumulative, with one factor resulting in a 1.7 times greater amputation risk, two factors in a 12.1 times greater amputation risk, and three factors in a 36.4 times amputation risk. To prevent diabetes-related lower extremity complications diabetic patients should receive routine comprehensive foot examination and risk assessment. A thorough history is important to assess for risk factors such as those noted above. Many of the risk factors are modifiable and should be addressed through counseling, education, and referral to the appropriate specialty. The foot examination should include a careful inspection of both feet as well as shoes. Ill-fitting and worn shoes can result in trauma from rubbing, especially in the face of deformities. If there is a loss of protective sensation (LOPS), this can lead to ulceration. The inspection of the diabetic foot should include the following evaluation. • Manual palpation of pulses: The examiner should be able to palpate both the dorsalis pedis and posterior tibial pulses. If questions regarding the presence or quality of the pulses are noted, a hand-held Doppler should be used to listen to waveforms and ensure patency of flow. • Skin quality: The color, temperature, and turgor of the pedal skin should be consistent with the proximal leg and the upper extremities. A significant decrease in the temperature gradients from proximal to distal can signal vascular impairment. Additionally, significant loss of skin turgor, dryness, and loss of hair growth can also be a sign of atrophy from lack of circulation as well as autonomic neuropathy. • Lower extremity venous changes: Pretibial or malleolar edema, varicosities, and stasis changes, such as hemosiderin deposition, induration, scaling skin, and atrophy, are signs of underlying venous disease. If there are concerns regarding the vascular status of a patient, then further testing such as Doppler arterial waveform and segmental pressure exam, transcutaneous oxygen pressure, and absolute toe systolic pressures should be performed. These tests can provide a better understanding of the arterial status of the lower limb. Individuals identified as having diminished circulatory status should be referred to a vascular specialist for further evaluation. If neuropathy is present along with deformity, this places a patient at high risk due to the increase in external and internal pressures from the deformity, resulting in callus formation, which is a precursor to ulceration. This, coupled with poor circulatory status, especially in a patient with diabetes, significantly increases the risk of amputation. Assessment should include identification of both sensory and autonomic neuropathy. Distal symmetric polyneuropathy is the most common finding affecting the lower extremity in diabetic patients. • Protective sensation to the foot assessed with Semmes-Weinstein monofilament: This test is performed with a 10-g monofilament with the patient's eyes closed to test superficial sensation at 10 different locations on the dorsal and plantar foot. Decreased protective sensation has been correlated with risk of ulceration. • Vibratory sensation: One of the earliest clinical signs of sensory loss in the foot is vibratory sense. A 128-hz tuning fork is used to test the patient's perception of the vibration and time of decay compared with the examiner's perception. • Deep tendon ankle reflexes: Absence of ankle reflexes has also been associated with increased risk of foot ulceration. As noted, structural foot deformities are a causal factor in the development of ulceration because of the increased internal pressure that occurs, as well the external pressure from shoe gear. The assessment should include both identification of deformities and an evaluation of joint mobility. Limited joint mobility, especially that of the ankle, increasing the peak pressures in the forefoot, which is compounded with deformities such as hammertoes, is a leading cause of ulceration. • Presence of deformities: Bunion, tailor's bunion, contracted digits (hammertoes), prominence of the metatarsal heads plantarly, and other bony prominences should be noted, as these are common sources of irritation and/or ulceration. At the same time, the patient's shoe gear should be assessed for proper style and fit. Deformity, neuropathy, and poorly fitting shoes are the most common causes of foot ulcerations. • Foot type with weight bearing (ie, high or low arch and heel position with standing): Understanding a patient's foot type and mechanics can help to identify reasons for the development of calluses, which are a precursor to ulceration. If there are abnormal foot mechanics, such as collapse of the medial longitudinal arch, this puts more pressure on tendons, ligaments, and joints and can lead to further collapse. In the presence of neuropathy, Charcot neuroarthropathy can occur. Charcot is a joint destructive process that leads to foot collapse and subsequent abnormal pressure distribution and ulceration. It is characterized by a red, hot, swollen foot with collapse of the arch and radiographic findings of joint collapse in the later stages. This is a severe disease state and must be recognized and treated appropriately to limit long-term sequela. • Presence of previous amputation: Amputations can lead to a change in foot dynamics and plantar pressure distribution, which can lead to new ulcer formation. Careful attention must be made dermatologically to all areas of the foot, dorsally, plantarly, and interdigitally as well as to the nails. Assessment should include an overall skin survey, examining skin texture and turgor, and the noting the presence of fat pad atrophy. Areas of erythema from pressure or rubbing, interdigital lesions or maceration, open wounds, ulceration, rashes, or other dermatologic abnormalities must be identified. The integumentary exam can give additional insight into the circulatory status of the limb. Temperature, specifically an increase, can also be a sign of impending skin breakdown. Assess for focal edema or bruising, which may be a sign of trauma or underlying injury. Likewise, note the presence of hyperkeratotic lesions (calluses). The presence of mechanical deformities and increased areas of pressure, friction, or rubbing contribute to the formation of calluses. Calluses must be carefully debrided in high-risk patients to prevent further breakdown; it's also important to address the source(s) of the callus. Appropriate shoe gear needs to be firmly addressed with the patient and family. If there is any discoloration of the callus (black or blue), this most likely indicates trauma to the underlying tissue and the area is either preulcerative or ulcerative. Examine for ulceration. In diabetic patients, especially those with LOPS and PAOD, ulcerations must be identified as soon as possible and the appropriate treatment instituted. It's critical to evaluate nail changes. Changes such as thickening or hypertrophy, discoloration, presence of subungal debris, and lysis from the nail bed are common in long-standing diabetic patients. These changes can be due to a decrease in circulation, mechanical irritation from digital deformities, or from fungal causes. When nails are thick, there is an increase in pressure on the underlying nail bed, particularly if ill-fitting shoes are worn. This increased pressure can lead to nail bed ulceration and if present in combination with neuropathy and/or PVD, can ultimately lead to digital amputation. For most high-risk diabetic patients (those with LOPS or PAOD), the mainstay of treatment for dystrophic or gryphotic nails is periodic debridement to decrease thickness. Evaluation of shoes in patients with diabetes is extremely important. The physician should determine whether the shoes are appropriate for a patient's feet. Shoes should not be broken down, should provide appropriate support to the foot, and should not rub and create pressure or friction to any area of the foot, particularly structural deformities. If appropriate based on risk factors, extra-depth shoes may be prescribed to help reduce pressure areas in patients with PAOD and/or LOPS. A team approach to the prevention and treatment of lower extremity complications in patients with diabetes is imperative. The primary care physician is the first line of defense in recognizing the modifiable risk factors for ulceration and also should be performing routine foot examination in all diabetic patients to identify lower extremity risk factors. A foot and ankle specialist should be included in the care team of all diabetics with risk factors for ulceration, especially once either neuropathy or PAOD is identified. Additionally, other specialties must be involved early and often when appropriate, including vascular surgery, endocrinology, infectious disease, diabetes education, wound care, and orthotics for shoe fittings. Ulcer risk and the follow-up guidelines for frequency of high-risk foot care based on the recommendations of the International Working Group on the Diabetic Foot (IWGDF) are described in Figure 2. When patients develop neuropathic, nonischemic foot ulcers, debridement and offloading are key to healing the ulcers. When wounds are present for extended periods of time, they become chronic. Chronic wounds have been shown to have increased proteases, inflammatory cytokines, matrix metaloproteases, and bioburden. These factors lead to a decrease in growth factors and cell proliferation. 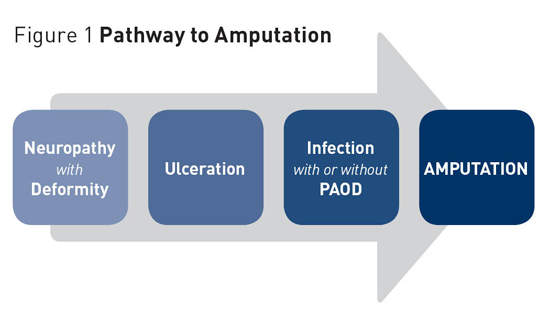 Debridement down to bleeding base in nonischemic ulcers converts a chronic wound environment to an acute wound environment. The ulcer is then flooded with growth factors, leading to increased cell proliferation. Wound debridement should be avoided, however, in ischemic foot ulcers unless severely infected. Debridement will lead to further cell tissue death and necrosis. These patients should be referred to a vascular surgeon for vascularization prior to debridement. As noted, diabetic neuropathic foot ulcers develop in areas of high pressure. The body responds by developing calluses or blisters. Calluses are the precursor to ulcers in diabetic patients with LOPS. The patient is unable to feel pain in these areas and continues to walk on the foot until the tissue breaks down and ulceration occurs. Hyperkeratosis will build up around the wound edge, leading to further increased pressure and breakdown of the soft tissue. All callused tissue must be removed by debridement to evaluate for underlying ulceration and to decrease risk of further breakdown by reducing the pressure. External offloading of the foot can further reduce pressure. The IWGDF has made recent recommendations for offloading of the foot. In neuropathic patients with good blood flow and plantar forefoot ulcers, nonremovable knee-high casts or boots should be used with appropriate incorporated offloading. If this is contraindicated or not tolerated, then a removable knee-high boot or offloading shoe should be utilized. Patients should be educated about the risk of going barefoot, stocking footed, or wearing thin-soled standard slippers at home or in public. This leads to increased pressure on the foot and delayed healing. — Mindi J. Feilmeier, DPM, FACFAS, and Katherine Frush, DPM, FACFAS, are podiatrists and assistant professors in the College of Podiatric Medicine and Surgery at Des Moines University in Iowa. 1. Diabetes latest. Centers for Disease Control and Prevention website. http://www.cdc.gov/features/diabetesfactsheet/. Updated June 17, 2014. Accessed March 20, 2016.
files/APMA%5FTodaysPodiatrist%5FInfographic%5F8%2E5x11%5FNOCROPS%2D2.pdf. Accessed March 23, 2016. 3. Baba M, Davis WA, Davis TM. A longitudinal study of foot ulceration and its risk factors in community-based patients with type 2 diabetes: the Fremantle Diabetes Study. Diabetes Res Clin Pract. 2014;106(1):42-49. 4. Boulton AJ, Armstrong DG, Albert SF, et al. Comprehensive foot examination and risk assessment: a report of the task force of the foot care interest group of the American Diabetes Association, with endorsement by the American Association of Clinical Endocrinologists. Diabetes Care. 2008;31(8):1679-1685. 5. Guerrero-Romero F, Rodríguez-Morán M. Relationship of microalbunineria with diabetic foot ulcers in type II diabetes. J Diabetes Complications. 1998;12(4):193-196. 6. Singh N, Armstrong DG, Lipsky BA. Preventing foot ulcers in patients with diabetes. JAMA. 2005;293(2):217-228. 7. Armstrong DG, Lavery LA. Diabetic foot ulcers: prevention, diagnosis and classification. Am Fam Physician. 1998;57(6):1325-1332, 1337-1338. 8. Hinchliffe RJ, Brownrigg JR, Apelqvist J, et al. IWGDF guidance on the diagnosis, prognosis and management of peripheral artery disease in patients with foot ulcers in diabetes. Diabetes Metab Res Rev. 2016;32(Suppl 1):37-44. 9. Sloan FA, Feinglos MN, Grossman DS. 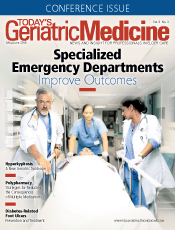 Receipt of care and reduction of lower extremity amputations in a nationally representative sample of U.S. elderly. Health Serv Res. 2010;45(6 Pt 1):1740-1762. 10. Carls GS, Gibson TB, Driver VR, et al. The economic value of specialized lower-extremity medical care by podiatric physicians in the treatment of diabetic foot ulcers. J Am Podiatr Med Assoc. 2011;101(2):93-115. 11. Bus SA, Armstrong DG, van Deursen RW, Lewis JE, Caravaggi CF, Cavanagh PR. IWGDF guidance on footwear and offloading interventions to prevent and heal foot ulcers in patients with diabetes. Diabetes Metab Res Rev. 2016;32(Suppl 1):25-36. 12. Armstrong DG, Frykberg RG. Classifying diabetic foot surgery: toward a rational definition. Diabet Med. 2003;20(4):329-331. 13. Bevilacqua NJ, Rogers LC, Armstrong DG. Diabetic foot surgery: classifying patients to predict complications. Diabetes Metab Res Rev. 2008;24(Suppl 1): S81-S83.